Learn how to configure the OAuth Security Policy to enable API authorization using OAuth 2.0 in Community Manager. The OAuth Security Policy is a Community Manager policy that enables API authorization using OAuth 2.0. It uses the OAuth configuration assigned to an API when enforcing OAuth tokens in a received request. As part of the Community Manager installation, a default OAuth Security Policy is added to the Policy Manager Management Console. In the Community Manager developer portal, the API Admin first sets up OAuth Details: from the API Details page, from the drop-down list to the right, choose OAuth Details. 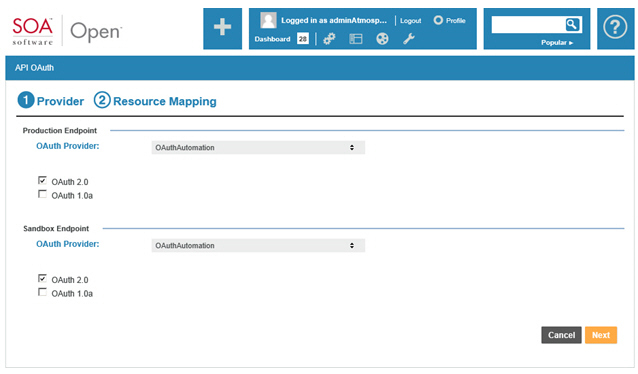 Specify details such as OAuth Provider, OAuth version, and resource mapping, and save. After the OAuth Details are configured, add the OAuth Security policy to the API implementation: From the API Overview page, click Implementations and choose the implementation. In the Policies section, click Edit. Find the OAuthSecurity policy, click Attach, and click Save. There is an additional configuration option to the OAuth Security policy, TokenTransformation, which you can use to ensure that the OAuth bearer token is relayed to the downstream service, rather than being stripped off from the request message after validation by the API Gateway. You can use this for scenarios where the target endpoint needs access to the original OAuth token that the API Gateway validated. The transform attribute of this policy determines whether to strip the headers or pass them through to the next hop. The possible values of this attribute are strip and pass-through. An example of the policy configuration with the nested configuration tag is shown below. configuration assigned to an API when enforcing OAuth tokens in the received request." If you change this value to pass-through, the OAuth bearer token is relayed to the downstream service, rather than being stripped off from the request message after validation. In the IncludeTokenAttributes node of the OAuth Security Policy, you can disable the adding of custom headers. You can then use a custom policy to add the headers however you want to transfer this information to the target endpoint. If the policy definition does not include the <IncludeTokenAttributes> node, or includes the default value as shown below, the API Gateway platform sends the OAuth grant details to the target endpoint in the custom http request headers. If the policy definition includes the <IncludeTokenAttributes> assertion with a value of none, as shown below, the API Gateway platform does not include OAuth grant details to the target endpoint. AND (default configuration): if multiple scopes are defined, all must be present in the access token. OR: if multiple scopes are defined and only one is present in the access token, with ScopeRequirement set to OR, the policy condition is met. An example (the default) is shown below. Let's take a quick walkthrough of the OAuth Security Policy configuration process to get you started. 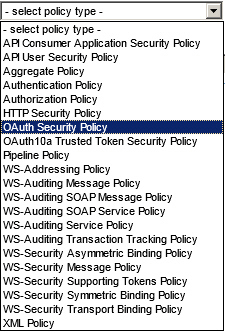 Verify that the OAuth Security Policy is present in the Policies folder of the Community Manager Tenant Organization as illustrated below. It should be added automatically as part of the Community Manager feature installation. If the policy does not display or you need an additional instance of the OAuth Security Policy to customize, use Add Policy to create one. On the API Details page, select OAuth Details, select the OAuth Provider, set the OAuth version to OAuth 2.0, and configure your Resource Mapping based on your requirements. On the API Details page, select Edit, go to the Proxy page, select the OAuthSecuritypolicy, and save the configuration.